Geneva: Earlier on Thursday, October 4,2018, Internal Affairs Minister Honorable Varney Sirleaf and team held a high-level meeting with the Head of United Nations High Commissioner on Refugees (UNHCR) His Excellency Filippo Grandi in Geneva, Switzerland. The meeting was requested by the Minister with the UNHCR High Commissioner to convey a special message from President Weah and further concretize Government of Liberia's position on Refugee program of Liberia. 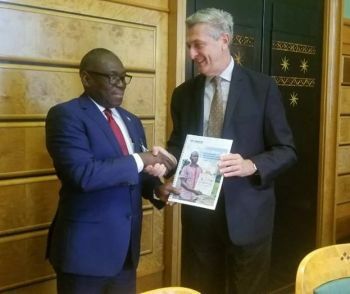 The Minister was along with Honorable Festus Logan, Executive Director of Liberia Refugee Repatriation &Resettlement Commission (LRRRC)and the Head of Mission in Geneva, Ambassador Paul Tate. Hon Varney Sirleaf presented a documentary on achievements of Liberia and UNHCR which contains certification of 375 former Sierra Leonian refugees who were recently given naturalization certificates by President George Manneh Weah and plans for construction of quality, durable housing units(similar to President Weah's pro-poor housing project) for Ivorian refugees who have opted to be locally integrated in Liberia and to also be beneficial to host communities. Minister Sirleaf said, as former UN Ambassador, President Weah is committed to peace and wellbeing of those freeing crisis. At the same time the Minister is pushing for technical support to LRRRC to be fully prepared to assume total control as the UNHCR ceases active operations in next 2 years. In response, High Commissioner Grandi lauded Liberia for a being post war success story and now well advanced in the Global Compact on Refugees.